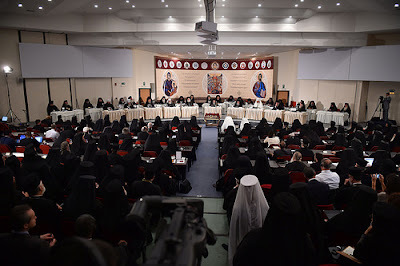 The Holy and Great Synod is called to manifest in the contemporary world a dynamic Orthodox tradition, open to the searchings of humanity, constantly inspired by the surety of the Cross and Resurrection and radiating the truth and love and beauty of Orthodoxy. "Now to Him who is able to do immeasurably more than all we ask or imagine, according to His power that is at work within us, to Him be glory in the Church and in Christ Jesus throughout all generations, for ever and ever. Amen" (Eph. 3:20-21). Source: From the Address at the Opening Session of the Holy and Great Synod, 19 June 2016. Translated by John Sanidopoulos.